The rugby field (pitch) step by step. Markings and explanations. Look and understand. Get the complete picture so you will remember. Red - dashed line, distance from touch line to the front of a lineout. For more details continue to "Ground area", then "Next step"
or just select a topic...or simply scroll down! "Rugby ground" is the area of land where the field/pitch is laid out. It should be grass but other surfaces which are not hard are allowed. Rugby grounds include the field and the area closely surrounding it. There's a touch-line along each side and a dead-ball line at each end. If the ball or a player carrying the ball touches any of these lines (or anything or anyone outside these lines) the ball is out of play. The game stops and must be re-started. The halfway line divides the field into two equal halves. Two teams play. Each team defends one half and attacks the other. At half time the teams swap ends. Yes it`s in the middle! 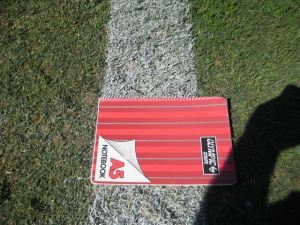 No matter what the field dimensions are, the half-way line is drawn so that it is exactly mid-way between the goal-lines. This means on a pitch that is 100m long it is 50m from the halfway line to the goal-line. On a pitch that is only 94m long (the minimum length), it is only 47m from the halfway line to the goal-line. This is an important difference because you often make decisions based on where you are on a field - on knowing how far and how fast you can run or how far you can kick. Basing your decisions on the assumption you are 50m from goal (because you are on the halfway line), when it`s only 47m could have unwanted consequences. A short line intersecting the half-way line indicates the centre of the pitch where start and restart kicks are to be taken. There is a goal-line for each half of the field. At the centre of each goal-line is a set of goal posts. The goal line and the area behind it are called the "in-goal area". is the ground behind the goal-line.......TRY! is the goal posts and any padding.......TRY! EXCLUDES the touch-line behind the goal-line NO try!!!!!! EXCLUDES - the dead ball line..NO try!!!!!! The in-goal area has no set dimensions. It is always the same width as the whole field. The actual depth may depend on the amount of space available or on the preferences of the home team. The maximum depth of the in-goal area is 22 metres. The law says it must be a minimum of 6 metres. It can make a big difference when you attempt to score tries. With deep in goal areas you can even use evasion techniques (rugby sidesteps) to get a try nearer the posts. This will make it easier for the player taking the place kick to convert the try and score more points. Check the field you are about to play on. If your team regularly scores tries by kicking into the in-goal area using rolling grubber kicks then running in to ground the ball, you may be affected by a smaller than usual in-goal area. The field of play is the part of the field with the touch-lines along the sides and goal lines across the ends. Sometimes the game restarts with a drop kick from within the 22 area. It must simply cross the 22-metre line. This line can also be important when "kicking for touch". The ball may be kicked "into touch" (across either touch-line) from anywhere on the field. It's a way of moving forward, gaining ground during normal play. If you kick from behind your 22-metre line the game restarts where the ball crosses the touch-line. It's different if the kick is from in front of your 22-metre line. If the ball bounces on the ground before going into touch the game restarts where the ball crosses the touch-line. If the ball doesn't bounce (called "out on the full") the game restarts in line with where the ball was kicked. If the kicking team took the ball back behind the 22-metre line before the kick, it is treated as though the kick was from outside the 22-metre line. You restart play with a lineout. If you put the ball into touch, they throw the ball into the lineout. If they did, you throw. You may also kick for touch when awarded a penalty. No matter where you kick from, a lineout takes place where the ball crosses the touchline and you get the throw. You often kick for touch with a spiral punt kick from inside the 22 area. Outside the 22 you sometimes kick for touch with a bouncing grubber kick to make sure it touches the ground before going in to touch. Find out more about the different types of kick when you visit the kicking skills pages. In rugby games, you start play (and restart after points are scored) with a kick-off using a drop kick from the centre of the halfway line towards the opposition who are waiting in their half of the field. The ball must travel at least 10 metres beyond the halfway line. It may touch the ground, but it must go the 10 metres away from halfway. So this can be easily judged a dashed line is placed 10 metres from halfway, both sides of the halfway line. Play stops when the ball goes "into touch" (across a touch-line). You restart play with a lineout. This line shows the minimum 5metre distance the ball must travel to the front of the lineout. Players taking part in a lineout must stand within 15 metres of the touch line. The rear of the lineout lines (one at each side of the field) show the maximum length of the lineout. In some cases scrums, penalties or free kicks are to be 15 metres in from the touch-line. These lines show where that is. Sometimes a penalty or scrum will be awarded and must take place 5 metres from the goal-line, in line with a point along the goal-line decided by the match official. These lines indicate the required distance from the goal-line.The dashes are usually placed only at the intersections with 5 and 15 metre lines and in front of the posts. Width of lines seems to range from 5cm to 15cm. I've searched for an 'official' line width, but without success. Here they suggest a width of 5cm but I decided to find out myself. Concord Oval is home to the West Harbour Pirates and Googee Oval is home to Randwick. Both teams play in the premier Sydney competition, the Shute Shield. I measured the lines at both grounds. They were both aapproximately 15cm wide. On a school field 5cm is probably appropriate but on major grounds 15cm looks very good. For practical reasons it appears that measurements are made and whatever line is required is produced by a machine straddling the measured position of the line. This means, say, that the field of play is 100m minus half the width of each of the two goal-lines. That is 100m - 2 x 7.5cm. You may not think viewing the field as a whole is easy. You could practice when you have spare moments. Close your eyes, picture each part. Move around, change direction, go all over. See the lines you know. Think about the rules that apply and remember. You can use rugby sidesteps anywhere! the dashed lines as shown have many dashes so they are easy to remember. The dashed lines actually on the field are in the places shown, but have fewer dashes. Dimensions must be as close as possible to the figures given above. The maximum length of the "field of play" is 100 metres. That`s the distance between the two goal lines. You know what your maximum sprint distance will be! Take field length and field position into account when you decide on your next actions. You can break a defence with a sidestep but it is best to do it near their end of the field so you are likely to get a try and there is less chance of being run down after you have made the break. That`s not to say you can`t put a few together and go the length of the field. Even one may be enough if you have the speed to keep clear of chasing defenders or have a speedy player backing you up. At higher levels in the sport the length would usually be the maximum. At lower levels it may be worth checking the dimensions of the field you are about to play on. Length variations are likely to be small, but could affect the quality of your decisions and accuracy of your kicks both in general play and shots for goal. The chip kick in behind the defence may not be as easy on a shorter pitch because the fullback will have less ground to cover. The 10 metre line is relative to the half-way line. If you`re playing away and you`re on the opposition 10 metre line you may be 3 metres closer to or further from the opposition try-line than on your home ground. The maximum width of the field is 70 metres. Again at lower levels it may be worth checking the dimensions of the field you are about to play on. Fields significantly narrower or wider than you are used to could really affect your game and you should be aware of how the pitch you are about to play on compares with your own. On a narrower field you may feel cramped. The amazing jink may come in more useful. If you are used to using wide open spaces to run around the opposition you`ll have to straighten your attack. But you`ll find it easier to defend. On a wider field, be aware. There`ll be more ground to cover in defence. In attack you`ll be used to having to run straight on a narrower field and will probably use the extra width well. Maybe one of your bouncing grubber kicks put through the defence would be easier and more useful than usual. The 'perimeter area' is a strip of ground surrounding the playing area, if possible at least 5 metres wide. This area is there to prevent injury when players are tackled into touch or end up running off the pitch. 'Perimeter' could also mean the edges. You may want to know the distance round the perimeter so you know how far you`ve run each time you do a lap. A full size pitch with 22m ingoal areas would add 48m, total 428m. You find the area of the field by multiplying length by width. A typical length is 100m for the field of play plus the depth of the ingoal areas at both ends of the field, say 10m each - total 120m. The width is typically 70m so the area = 120m x 70m = 8400 sq m.
A full size pitch (22m ingoal) would be 144m x 70m = 10080 sq m.
Dimensions include the posts - 5.6 metres wide. The top edge of the cross bar is 3.0 metres from the ground. The minimum height of the posts is 3.4 metres. We used to call the goal posts "the sticks"
"He/she sidestepped the fullback and put the ball down under the sticks". The posts and any padding are part of the ingoal area. You can score a try by grounding the ball against the posts. In rugby kicking, for you to score points from any type of goal (conversion, penalty or drop goal) the ball must pass over the cross bar and between the posts. Here`s a video clip where the ball did just that before being blown back over by the wind. The points were awarded - because it had gone over. "Pitch" is a word with many meanings! Put it together with "rugby" and it narrows it down a lot. Search through the World Rugby document "Laws of the game Rugby Union" and there is only one mention of "pitch". They describe rugby traditions of opposing teams enjoyment of each others company away from the actual game of rugby. As they say, "away from the pitch". Everything else about the rules of rugby or the laws of the game of rugby is described in terms of the "field" or "the field of play". Growing up I always used the term "pitch". I recently started using "field" and I`m wondering why! What comes to mind is this. I grew up playing school rugby at a large school for boys. The Rugby First XV played matches on the single rugby field at school. Although I would still have called it the pitch. The rest of us went to the other, distant "playing fields" where a large number of places to play rugby were marked out, all fairly close to each other. Because there were so many of them to talk about and identify our "rugby field" was not possible. We talked about which "pitch" we were on in the same way other people talk about pitches meaning the particular bit of a larger area that has been allocated to them. Here I`m thinking of street performers, book-makers, market stall-holders, campers and similar people with pitches.That`s my theory!